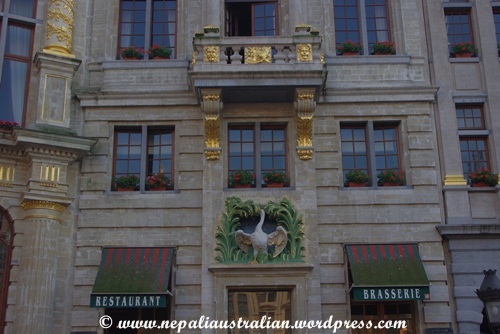 I have to mention the hotel we stayed in Brussels. 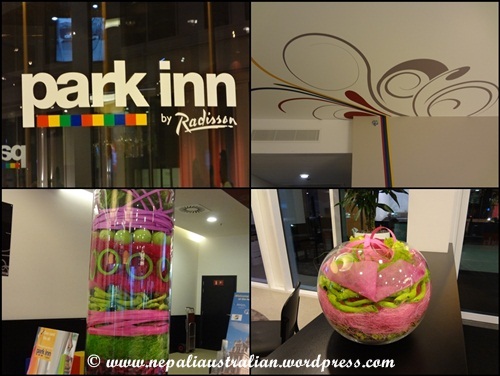 It was Park Inn by Radisson and they had one of the best rooms that we stayed in, in the whole Europe trip. I just loved the room we were given. It was a corner room on the second floor, very large, clean, quiet and nicely appointed. The bed was very comfortable and the bathroom was clean and modern. I especially liked the colours throughout the place. A colour scheme of red, yellow, green and blue played out across the hotel and our room giving a uniform and modern feel. 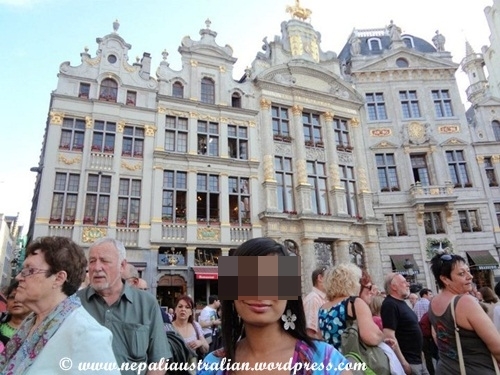 Brussels is one of the best places we visited, with its small town charm, trendy bars and restaurants, fabulous food, great nightlife, fantastic shopping, numerous museums, and other attractions including the diverse and interesting exhibitions and festivals. 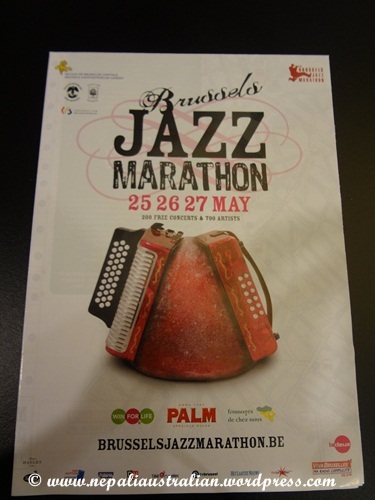 While we were there, we witnessed the Jazz festival. We had a local guide who took us around the city. 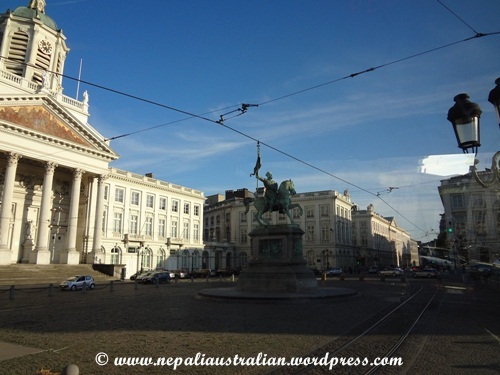 So after we freshened up from the bus journey, we got on our tour bus and the guide explained the different places in the city as we drove around. Our first stop was Parc du Cinquantenaire. 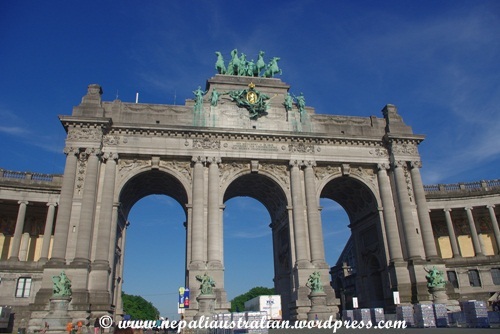 The Parc du Cinquantenaire was built to commemorate Belgium’s 50th anniversary as an independent nation. Cinquante means fifty in French. If you’ve ever wished to have seen the gorgeous World’s Fair buildings circa 1900, this is as close as you’ll get. The structures are massive, well-designed, and exquisitely ornamented. There are several museums in the park — including the Royal Military Museum, the Cinquantenaire Art Museum, and the AutoWorld Museum. 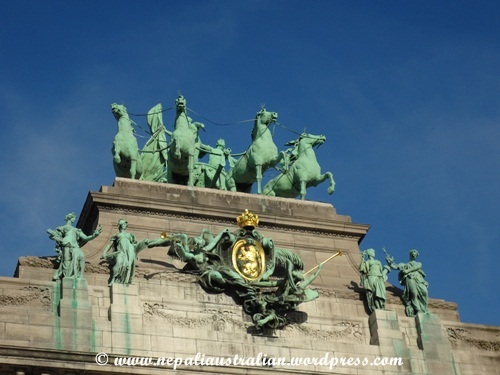 The masterwork of the Parc is the Triumphal Arch, a breath-taking structure completed in 1905. Even though you are right on top of a busy road way it is so quiet and there is a fountain on one side and a garden area on the other. 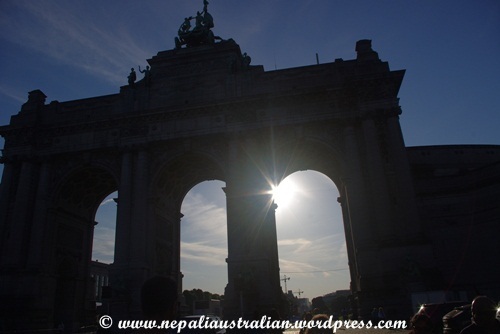 The palace is situated in front of Brussels Park. 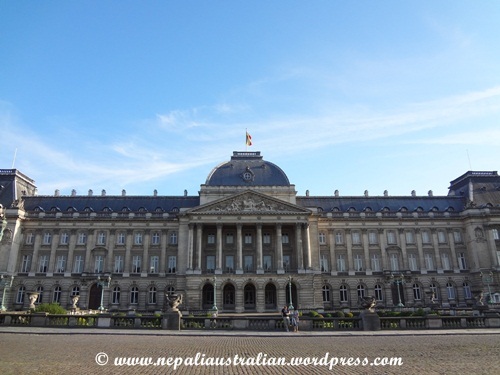 The middle axis of the park marks both the middle peristyle of the palace and the middle of the facing building on the other side of the park, which is the Palace of the Nation (the Belgian Federal Parliament building). 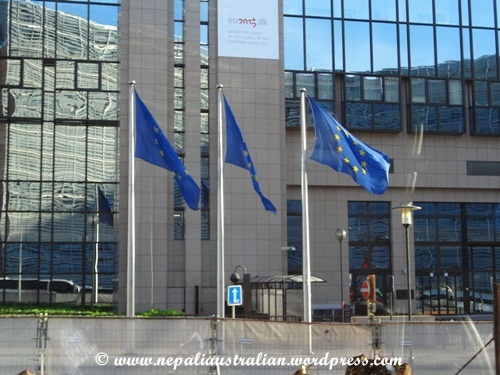 The two facing buildings are said to symbolize Belgium’s system of government: a constitutional monarchy. We didn’t go inside the Palace but just strolled outside it. From The Royal Palace (Palais Royal) we went to La Grand-Place. It is surrounded by guildhalls, the city’s Town Hall, and the Breadhouse. It is an outstanding example of the eclectic and highly successful blending of architectural and artistic styles and every building is so beautiful. It is a UNESCO world heritage site. While we were there the place was packed with music lovers as the Jazz Marathon was on. It was worth the experience and the people were fantastic. You can stroll the cobble stones looking at every house, which are just gorgeous. The surroundings are full of restaurants and shops. 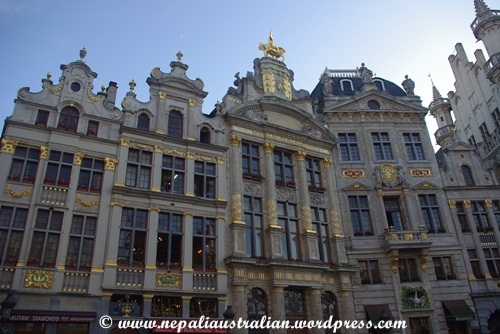 As the guide explained about this grand place I was in awe of this beautiful place where buildings had golden details. It definitely looks like from a period movie. After a brief look around the place and enjoying the music, we went for a walk and landed in Belgium waffle heaven. OMG, you could imagine what you want and there it was. 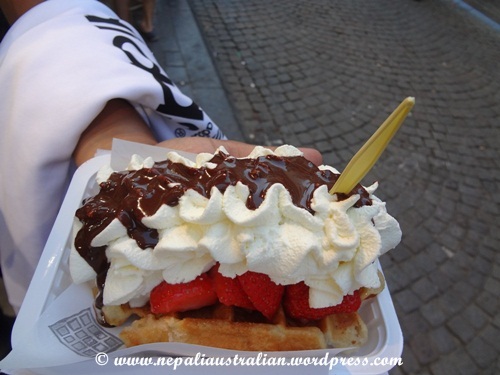 There were rows of shops selling these awesome looking waffles and you couldn’t go past them without having one. 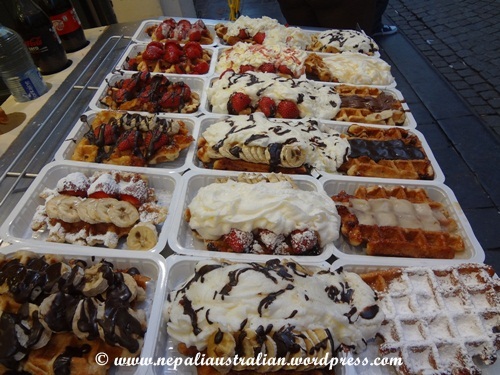 As AS and I was no exception, we indulged on the heavenly waffles and made our way to Manneken pis. This statue must be one of the most famous statues despite of its small size. It is a small bronze fountain sculpture depicting a naked little boy urinating into the fountain’s basin. The famous Manneken-Pis remains the emblem of the rebellious spirit of the City of Brussels. His wardrobe counts more than 800 suits. The Museum of the City of Brussels presents one hundred of these suits. A multimedia database allows the visitors to consult the whole wardrobe of the famous ‘ketje’. The statue is dressed in a costume several times each week, according to a published schedule which is posted on the railings around the fountain. 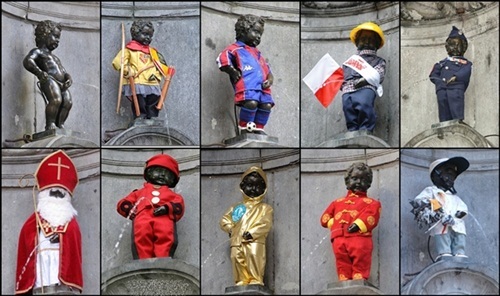 The costumes are managed by the non-profit association The Friends of Manneken-Pis, who review hundreds of designs submitted each year, and select a small number to be produced and used. 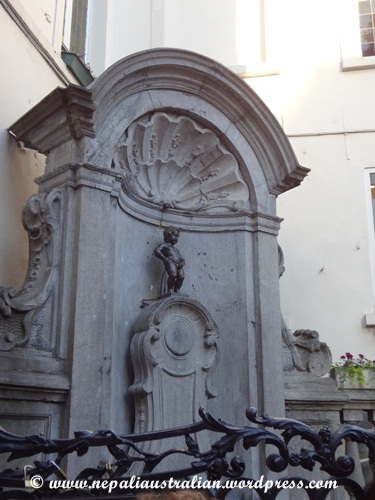 Manneken-Pis was at first a fountain that played an essential role in the former distribution of drinking water since the 15th century. The system was well-known in all of Europe. Towards the end of the 17th century, the statue became more and more important in the city life. It was also a survivor of the bombardment of Brussels in 1695. Manneken-Pis became a precious good and enjoys a ceaselessly growing glory. 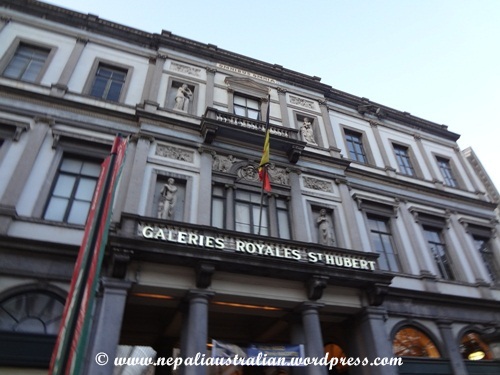 From Manneken-Pis, we went to Royal Saint-Hubert galleries. It is a glazed shopping arcade. Back in its early days, it was a place the rich and famous would go to attend meetings. Its neo-Renaissance styling sports a vaulted glass room which lets the light in during the day while protecting shoppers from the elements. There is a simple straight pathway with openings on either end and lined on both sides with booksellers, chocolate shops, cafes, and other shops. 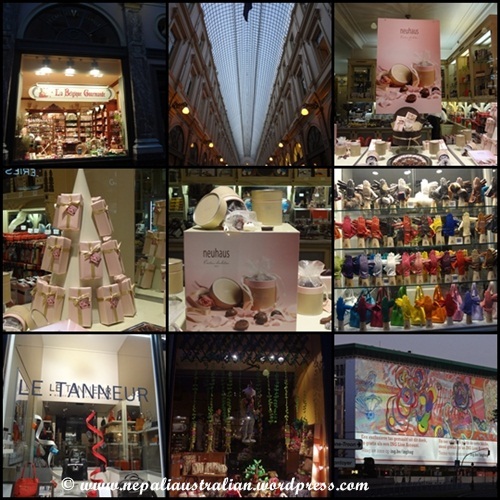 The window displays are wonderful and worth walking through even just to window shop. It also makes a nice short-cut getting from one part of the city to another without having to walk around the building. Chocolate lovers should visit Neuhaus, the best chocolate-maker in this chocolate-mad country; they claim to have invented pralines in this shop. You can buy prettily wrapped boxes of the “best-in-the-world” chocolate to take home.